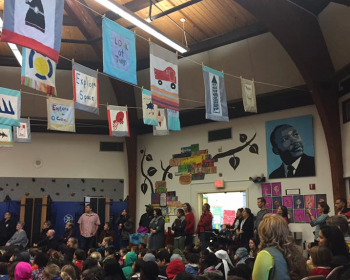 We had a wonderful Martin Luther King Jr. Oratorical Fest last week. The students did such an amazing job sharing poems, speeches and powerful words related to the messages of MLK and other leaders, including themselves! I want to thank participants and their families for supporting their participation. Another great Oxford event is coming up: the Emmy Orth Strong Women of the World Celebration. Flyers were sent home a few weeks back; an email version was also sent out. If you have any questions, feel free to ask your child’s teacher or me. Projects are due 2/28/17. They will be displayed for one to two weeks on tables in the hallway and on the walls for everyone to enjoy. The big celebration will be at Community Meeting on Friday, March 24. Everyone is welcome to join the celebration! And my special request to all of you: if you aren’t already planning on doing so, please consider coming to the Oxford Auction event on Saturday, March 18. You can dress up ‘80’s style or just come as you are. You can bid on things or just come and meet a few people and hang out with other Oxford parents. Don’t know anyone? Well, you know me and there will be staff there, too. It would be great to have everyone there and to have that chance to hang out and visit. Please? Oxford’s got many fun and interesting things happening after the 4-day weekend and we hope this break helps you charge your batteries and enjoy what the school’s got to offer. On Tuesday 21, Farm Burger is hosting another Dine-Out to raise money for Oxford. 20% of all sales that night will be donated to our school, so please pass on the word and invite family and friends for a meal out at Farm Burger. On Wednesday 22 at 6:00 pm, Oxford counselor Ms. Jennifer Hays will be giving a presentation about on Social Emotional Well-being followed by Q&A. We hope many of you can come. There will be a potluck dinner, and the PTA will provide childcare. Oxford’s next Shop-and-Give event will be from February 27 to March 6. Simply go to TeaSchoolDays.com, enter the code SDS17OXFORD at checkout, and select 6–10 day shipping to receive 15% off + free shipping. 15% of your purchase will also be donated to Oxford! But note that the printed version of this letter is incorrect. Kid Dynamo is no longer doing the fundraiser, so the only way to help Oxford with Tea School Days is shopping online. We hope you can still collaborate—and get some cool clothes! And last but not least, have you seen the amazing Little Free Library our school has by the main entrance on Oxford Street? Thanks go to all the teachers and staff who are happy to share it with our community and to Ms. Rhine and Ms. Heidi for bringing it out! Take a book, leave a book—it’s as simple as that. 2016–17 is, after all, The Year of the Reader. In honor of Women’s History Month in March, Oxford students will get to hear special guest Kate Schatz, author of RAD American Women A–Z and RAD Women Worldwide, on March 3. She is coming free of charge to Oxford. Please consider supporting her by visiting Mr. Mopp’s and buying her books, reading them with your child, and talking about themes and good questions they might ask Kate. The books are in and just waiting for you to swing on by! At last week’s PTA meeting, I shared information regarding modernization plans for Oxford. It is a bigger project than originally proposed and very exciting! In 2017–2018, BUSD will be fixing up a campus (West Campus) at 2020 Bonar in order to have it usable for elementary schools. In 2018–2019, the plan is for Oxford students and staff to move to that site for a year while our building undergoes major reconstruction. Architects are currently working on plans and we will have staff and community meetings about the needs of the school as we move forward. It will be great for our little school to get a facelift! Student Council brainstormed a list and then narrowed it down to three choices. All Oxford students voted and we are now the Oxford Otters! The Student Council’s next assignment is to plan a spirit day and spread the word about a community service project. After Eight, You are Late! School starts at 8:00 am promptly. Please be on time! When your child is late, they miss valuable learning time, and it can be stressful for kids to enter the classroom after the day is already underway. After three unexcused absences, a district-created letter is generated through our attendance system and you will be notified of potential truancy issues. If the absences continue, a meeting will be scheduled with Family Engagement Liaison Carol Perez and me, so we can discuss strategies to improve attendance. For more information, please visit the BUSD BUSD Attendance FAQ page.